It is with shock and sadness that I add this page. 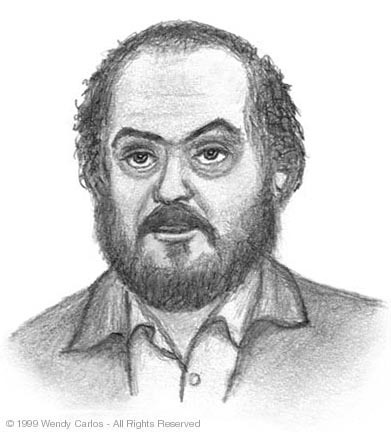 Stanley Kubrick, one of the great filmmakers, died in his bed of a heart attack on Sunday morning, March 7th 1999. When I first heard the report, I blinked twice in disbelief. It just seemed WAY too soon to bid good-bye to Stanley. Somehow, he was one of those people you get to think will always be there. And it's appealing to have known all these years that up there in Hertsfordshire, he was working away on some new project or other. SOMEone had been doing something new and special. After all, creative perfectionists have become nearly an anathema as the centuries increment. So much of what we are asked to read, to hear, to look at, even to eat, seems the result of expedience, a matter of pure commerce. Intelligence, even touches of genius (as he had ample times,) have become quaint relics of an earlier age. Our loss, more than you may think. I was one of the few artists to have worked more than once with him. The experience and memories are indelibly etched on my brain. The face-to-face meetings for spotting music to compose for "A Clockwork Orange" and "The Shining" couldn't have lasted very much more than a week or two each for me and my then partner and producer, Rachel (it would be unfair to Rachel to characterize her impressions here, and so these are only my observations, although she was present and worked with me throughout the details that follow.) Since my none-too-portable studio was located in New York, and Kubrick didn't travel, the rest of the collaboration took place via long phone calls and messages, express packages of cassettes, tapes, film and video footage, and written memos and notes. If faxing had been more available, and the Web had existed back then, it's certain we'd have used these media to communicate in great detail, too! Stanley Kubrick was not an easy man to work for. He was vastly interesting, completely open about all his "secrets", and had a dry sense of humor. You were always stimulated working with him. But it was seldom painless. I would truly have preferred to be another director or friend. Read Arthur C. Clarke's "The Lost Worlds of 2001" for another parallax on this observation -- even if it's essentially a congruent conclusion. (Once Stanley told me that aside from A.C.C. I was the most outspoken, candid person he had worked with. This merely means in my case that I had a big mouth, and sometimes still say too much, perhaps even here.) One works (damn, I keep using the present tense...) worked with him for other good reasons. All of this is completely in keeping with a demanding, even obsessive person of great depth who is trying to find the optimum answer for the smallest decision, however much time and effort it takes. I'm rather "tarred by the same brush" in many ways, close (= brave) friends inform me ;-), and understand, even empathize with such an attitude, including the times when it bites back. It's just that my new media music medium is more tractable to watch-making "godzinthuh" details, than the large-scale collaborative and social interactivities of making feature films. Who's to complain if I go for a fifty-seventh retake except my lazy side alter-ego (or possibly Heinz...?) Whereas Stanley got tagged early on as "overly demanding" or "inhumane". Having been the target myself of redo after redo, I empathize with both sides of this coin. You can understand why recent attempts since his death to paint a revisionist (revisionary "historians" -- right out of Orwell -- feh!) image of Kubrick as some kind of warm and fuzzy fond old uncle are both ignorant and bizarre. The world has plenty of avuncular supportive seniors already. What's in short supply in the world is Stanley Kubricks: artists who will spare no effort to do work of the highest caliber. Yes, it's impractical, and not a role most artists are able to inhabit with comfort, unless you command the respect and financial support system he needed. It allowed him to "wing it", the way most creative projects are intuitively "steered", kind of groping forward towards some kind of inevitability. He'd often risk experiments, creative trial and error. When Stanley liked what you were doing he supported you "all the way"; you'd be hard pressed to find a more canny supporter. Many young directors got messages and calls from him if he loved their newest film. (I'll bet Hitchcock, another real master, never did that!) Kubrick assembled a support system/nest to avoid most usual external needs to compromise. We may all envy him in this. It's also said that he was a recluse. Not really. A true recluse does not enjoy meeting new people, having hour-long phone calls with friends and associates, and inviting many of the most able people in a given field to come work with him. That allowed him to study them and their ideas, to figure out what makes them tick, in those most agreeable, flattering ways. I had the feeling Stanley enjoyed getting to know people. The reasons he seldom traveled were due more to human foibles: the risks of flying, or even driving much in a car, were unacceptable to him. It's an understandable matter of fear and statistics. With modern communications technology, it gets easier to pull this off each day, without becoming a hermit or misanthrope. Sad that with all the precautions he took, he did not gain a notably long life, as one might expect as fair trade for so modest a lifestyle. I liked Stanley, I enjoyed Stanley, I loved his intelligence and curiosity -- but he often drove me nuts. We'd completely, passionately disagree on some detail, where a day earlier we were seeing things in essentially congruent ways. Yin and yang. I think he rather took my abilities and attempts to please him for granted, but I never knew for sure, and now never will. I did try to do my best work for him each time, each "cue". How could you not? There are anecdotes that I can't get to here, pungent memories, trivia, nonsense and punsense, sad and funny stuff, too. Another time. Right now there continue to be too many pressures on me to assemble more than this ramble of an encomium. I couldn't get back to work without posting some reminiscences about Stanley Kubrick, and use this way to say "Farewell" over the "ether" that is our Net. When I began this page, I first drew the little sketch above, as I last remembered him (as usual, click on it for a bigger image), then tried to capture in words some of the complex feelings which two multifaceted, stimulating collaborations gave to me. I will miss him very much. Many others knew him and his wonderful wife (Christiane is a genuinely gifted painter and artist,) daughters (Vivian's a fine film maker and talented musician,) and family much deeper than I did. Others worked much longer right there with him, not "remote control" as we had to. Still others, like his urbane and witty, ultra-sharp Brother-in-law, Jan, were truly close, and knew him when no project was in progress, when he was relaxing, in "off" mode. They will have to speak for themselves. We shall miss him not as a mere celebrity (which many news reports and broadcasts did, damn them), but as a gifted artist and creator of some of the best films ever made. They will be watched, studied, and remembered long after the rest of us are gone, too. Pace, Stanley.